An important characteristic in automotive applications today is package size. Starting with the miniature 0603 size, and going up to a 3640 footprint, MLCC’s in C0G and X7R dielectrics are now offered in capacitances ranging from 100pF to 4.7µF, with operating voltages from 50V to 3kVdc. The -55°C to +150°C high temperature dielectric, X8R range, has been extended from a working voltage of 50Vdc up to 3kVdc which is one of the highest ratings in the market. Capacitance values have also been extended from 270pF up to 1.0µF (in a 2225 case size up to 3kVdc voltage rating). 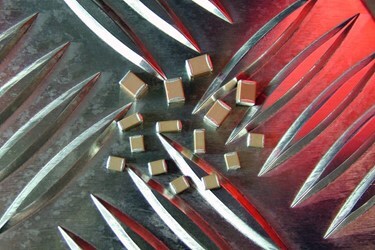 Maximum capacitance change is ±15% (without applied voltage) and available tolerances listed as ±5%, 10% and 20%. Package sizes are unaltered at 0805 to 2225. MLCC Surge and Safety types, in both C0G and X7R dielectrics, can now be supplied within the spectrum 4.7pF to 22nF and case sizes 1808 to 2220. These AEC-Q200 qualified parts are certified to X1, X2 and Y2/X1 ratings depending on type. For critical EMI protection applications the company offers both X2Y (balanced line) and feedthrough filters that are AEC-Q200 qualified. The E03 and X2Y products can now be specified with capacitance values of 330pF to 560nF over the rated voltages of 50V and 100V. For on-board EMI protection the E01 and E07 ranges of feedthrough C filters are 3 terminal chip devices designed to offer reduced inductance compared with conventional MLCCs when used in signal line filtering. These products are now fully qualified to AEC-Q200 in C0G and X7R dielectrics with chip sizes 0805, 1206 and 1806; capacitance range from 120pF to 68nF and voltage ratings up to 100V. A current rating of 300mA is standard for all E01 variants and 1 to 3 Amps for all E07 variants. To withstand the harsh environment of automotive applications the patented FlexiCapTM termination is available for all of the company’s AEC-Q200 product offerings. This innovative termination material was pioneered by Knowles brand Syfer Technology and provides improved resistance to the risk of mechanical stress cracking.